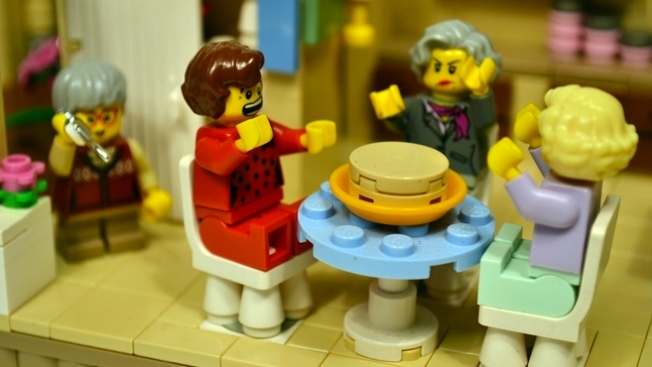 Lego has created a new "Golden Girls" toy set. From left: Sophia, Blanche, Dorothy and Rose. The "Golden Girls" LEGO set of your dreams could become a reality. A meticulously created set honoring the classic sitcom is just a sight to behold. There's LEGO Blanche (Rue McClanahan), Rose, Dorothy (Bea Arthur), Sophia (Estelle Getty) and even Stanley (Herbert Edelman) with accessories ranging from cheesecake — naturally — and platters for their heads to go on like Rose's (Betty White) dream after she had heart surgery. We weren't kidding about it being meticulous! The toy includes the foyer, living room and kitchen built pretty much like the show's sets. So you want this "Golden Girls" LEGO set? Of course you do. Well, you have to vote for it at the LEGO Ideas site. The world needs this. We got a "Ghostbusters" set thanks to LEGO Ideas, so get to work on making this "Golden Girls" set a reality. Because really, it's amazing. And think of the crossovers you could have! The Ghostbusters help out the Golden Girls with a ghost problem. The Golden Girls meet the Simpsons! The Golden Girls get a visit from the Avengers! Pharrell Williams chats with Seth Meyers about the first time he spoke with the late Michael Jackson, and Al Gore's "earth walking."